Car-sharing services in South Korea on Thursday intensified their marketing efforts while taxi drivers held a massive rally in protest of the planned launch of commercial carpool services. Another ride-sharing service, SoCar, offered an 87 percent discount on car rentals as part of customer service. Starting from midnight, the discount program is set to continue for 33 hours until 9 a.m. Friday morning, offering compact cars at 10,000 won and midsized sedans at 20,000 won. About 100,000 taxi drivers are estimated to have participated in a nationwide strike Thursday, which included a sit-in near the National Assembly. They are concerned that the ride-sharing service by the nation’s top mobile messaging provider will undermine their dominance in the transportation service industry. The drivers also held rallies in October and November. A taxi driver took his own life last week in protest of the planned carpool service. Kakao had planned to launch its Kakao T Carpool service on Monday but has delayed the plan. 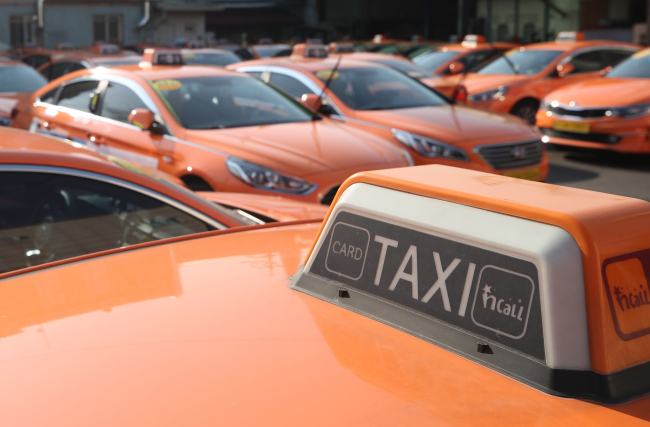 To quell concerns of taxi drivers, the government and the ruling Democratic Party of Korea have agreed to seek to improve the salary system for drivers of corporation-owned taxis.